Saint-Gobain Performance Plastics has developed SaniPure™ BDF™, a breakthrough innovation in high-performance polymer materials. SaniPure™ BDF™ is completely certified to be free of materials of animal origin and is the ideal choice for handling sensitive biological fluid transfer applications. SaniPure™ BDF™ combines the features of traditional silicone tubing with superior peristaltic pump life performance and low absorption characteristics. 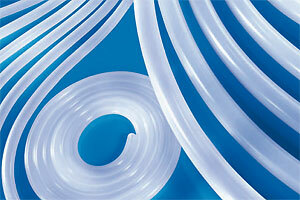 This tubing answers the industry’s requirements for performance, characterization and animal-free origination. SaniPure™ and BDF™ are trademarks of Saint-Gobain Performance Plastics.